Anti-Assad Fighters Said To Be Retreating From Beseiged Syrian District : The Two-Way "This is a terrible situation," an activist tells NPR in a Skype call from near there. "We need immediate help. ... There is no food, no medication and no water." 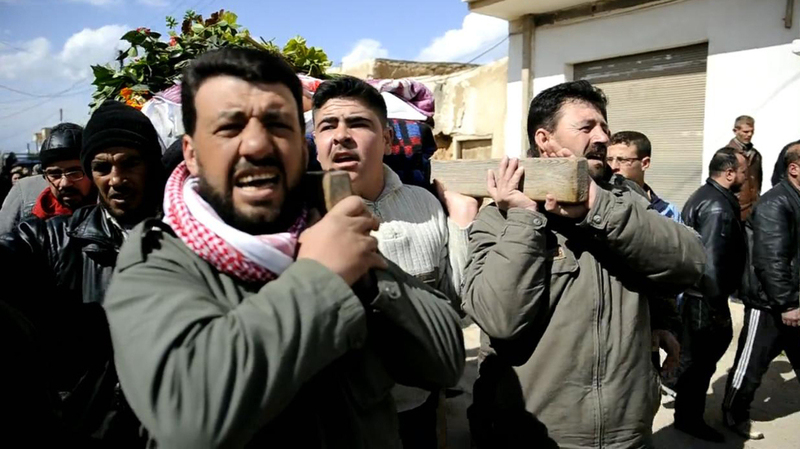 Syrian mourners on Wednesday carried the body of a man who was killed in fighting near Homs. There are reports from several news outlets that fighters who have been battling the Syrian Army in the beseiged Baba Amr district of Homs are retreating from that area. Indeed, a statement on Facebook that purports to be from "the Baba Amr brigade" says its fighters "have decided to strategically withdraw for the sake of the civilians remaining inside the neighborhood." The city has been under seige for weeks. A man who goes by the name Sami and who has been posting reports on the Web from his vantage point near Baba Amr, spoke by Skype to NPR's Andy Carvin and to The Guardian earlier today. He told Andy that "this is a terrible situation. ... We need immediate help. ... There is no food, no medication and no water" in the district." Sami told The Guardian that "I fear a revenge operation by the regime forces, because most of the residents here support the uprising. If the Free Syrian Army goes there will be no one to protect us. I feel scared that the army will enter the whole city of Homs." He also fears, Sami said to NPR, that once they have control of Baba Amr then forces loyal to President Bashar Assad "will invade another area." "The U.N. estimates that more than 7,500 people have been killed since the anti-Assad struggle started in March 2011, when protesters inspired by successful Arab Spring uprisings against dictators in Tunisia and Egypt took to the streets in Syria. As Assad's forces used deadly force to stop the unrest, protests spread and some Syrians took up arms against the regime. "Activists put the total death toll at more than 8,000, most of them civilians."